Reading is dying in our schools. Educators are familiar with many of the factors that have contributed to the decline—poverty, second-language issues, and the ever-expanding choices of electronic entertainment. 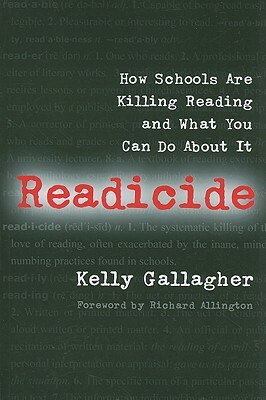 In this provocative new book, Kelly Gallagher suggests, however, that it is time to recognize a new and significant contributor to the death of reading: our schools. · losing sight of authentic instruction in the shadow of political pressures. Kelly, a "baseballoholic" and a self-described expert at negotiating airports, is in his 33rd year of teaching at the high school level. He believes that "there is no greater pleasure than teaching someone something." Teaching is "artistic, it matters a great deal, and I can never get the job down perfectly." Kelly thinks that professional development should treat teachers as such - professionals. "I know in the classroom that good things happen when my students have meaningful discussions. I know as a teacher myself that my craft sharpens when I am given the opportunity to have meaningful discussions with my peers. And let's have a laugh or two while we are at it." Writing his six books for Stenhouse was a solitary experience. "Though I have written outlines prior to each of my books, I have yet to follow any of them step-by-step. That is why I find writing rewarding - because the act of writing itself generates new thinking, and new thinking is always exciting."